Superb installment in the series - in fact, one of the best! This installment of the mythic monsters-series clocks in at 28 pages, 1 page front cover, 1 page inside front cover, 1 page editorial, 1 page SRD, 1 page ToC, 2 pages of introduction, 2 pages of advertisement, 1 page inside of back cover, 1 page back cover, leaving us with 17 pages of raw content, so let’s take a look! So, plants…to me, they always are the most creepy critters out there. I don’t know why, but fungi and plants, perhaps due to my allergies and their overt and covert means of causing harm, always felt truly disturbing to me. Similarly, a fascination with herbalism is immediately catered to by this pdf, for we begin with truly magical, mythic plants – what about bellflower-like plants that are sensitive to sound and can easily be activated by the pure voices of children – granting fast healing as well as allowing for age resistance? Yes, these plants are truly interesting and breathe the spirit of magic and the fantastic. Love them! Spell-wise, this also sports two new ones, one to grow potion-fruits and a high-level spell that lets you grow a tree of life – both of these are absolutely awesome. Creature-wise, we begin with the CR 4/MR 1 assassin vine, which is sentient and thus a great stalker and better ambush capabilities – nasty! (Oh, and the plant comes with a neat full-color artwork!) On the upper CR-range the CR 17/MR 7 Bodythief receives a brutal scream that not only deals damage, but also alerts all spawn creatures in a huge radius…oh, and the spawn they create are truly powerful…beyond a sample creature, we actually get a new template, the CR+2/+1 pod-paragon-creature…this is awesome and the step-beyond I really enjoy seeing! Most iconic, perhaps, would be the CR 12/MR 5 giant flytrap, which not only has acidic sap and mythic power-based alluring pheromones as well as healing from engulfed creatures – brutal and awesome. On the lowest CR/MR-scales, CR 2/MR 1 Leaf Rays can change colors based on the season and implant seeds in victims – cool! The CR 1/MR 1 Leshy benefit from woodland stride, thus making them brutal guerillas. Fans of Mr. King will enjoy the CR 6/MR 2 Living Topiary, which can root itself in the ground and combine entrap with trampling foes – glorious! At CR 5/MR 2, mythic mandragora get better blood drain and a rend that receives an increased poison DC – solid. The CR 10/MR 4 mythic quickwood receives magically-enhanced senses and may conjure forth tangles and even walls of roots for crowd-control tricks that complement the creature perfectly…oh, and mythic power-based quicker pulls are nasty, particularly if the target fails the save versus the accompanying stun…Awesome! The CR 8/MR 3 Shambling Mound comes per default with the giant template added (though a version sans it is provided) and may sink into the ground, creating a deadly, quicksand-like mire…oh, and beyond better vine attacks, they can make big, nasty, entangling vine bursts by plunging them into the ground. The CR 7/MR 3 Tendriculous gets paralytic spores, a paralytic bite…and 25-ft-vines to grab foes with…so yes, the thing actually has proper tendrils! Thanks for making the bland base creature finally more interesting. At CR 3/MR 1, the Yellow Musk Creeper may create instant zombies – neat. At CR 20/MR 8, the mythic Zomok is a true nightmare: Permanent tree transformation, entangling breath weapon and a sacrifice-based healing wave make this one absolutely brutal. The pdf, as always, comes with a new creature, lavishly rendered in full-color: The CR 15/MR 6 Venusi: Gigantic, purple vine-like alien plants, intelligent apex-predators and particularly well-suited to annihilating elves, they can infuse spores in the spinal columns of those trapped in their dread grasp, rendering their victims even more susceptible to their powers. Worse, soporific spore clouds and tendrils that can deliver touch attacks make them lethal…oh, and forest fires make them more dangerous, for these horrid *THINGS* are actually healed by fire damage! Have I mentioned that they sport caustic nodules and that they add fire and acid damage in a given round together for the purpose of resistance bypassing? This creature is a true beauty and one of the best original creatures in the whole series! Jason Nelson, Mike Welham, Alistair J. Rigg and Jonathan H. Keith deliver in this installment: Plants need to be tricky, but they also need to be efficient, somewhat realistic, if you will – we all know how plants work and while we want the fantastic, we also know our biology, so much like animals, this needed to be creative and magical, but still believable…and take creatures that are known for being deadly, but vulnerable and make them fearsome. This pdf achieved this goal with flying colors – all killer, no filler, this book takes some of the most boring creatures and breathes unique life and flair into them, while also providing superb supplemental material and a stunning new adversary. This is one of the strongest installments in the whole series – the final verdict will clock in at 5 stars + seal of approval – get this now! 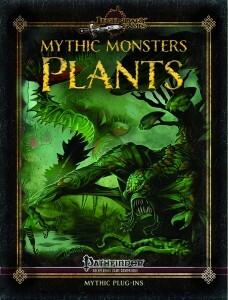 You can get this glorious collection of mythic monsters here on OBS and here on d20pfsrd.com’s shop!